I have personally used FR after exercise, I have also advocated it as a form of treatment to my patients, with mixed reactions particularly to how uncomfortable it is! I have found it to bring about therapeutic benefits albeit short-lived and very subjective. However I do question the claimed physiological benefits, despite this I use it as with all my treatments as an adjunct to my rehabilitation programs. 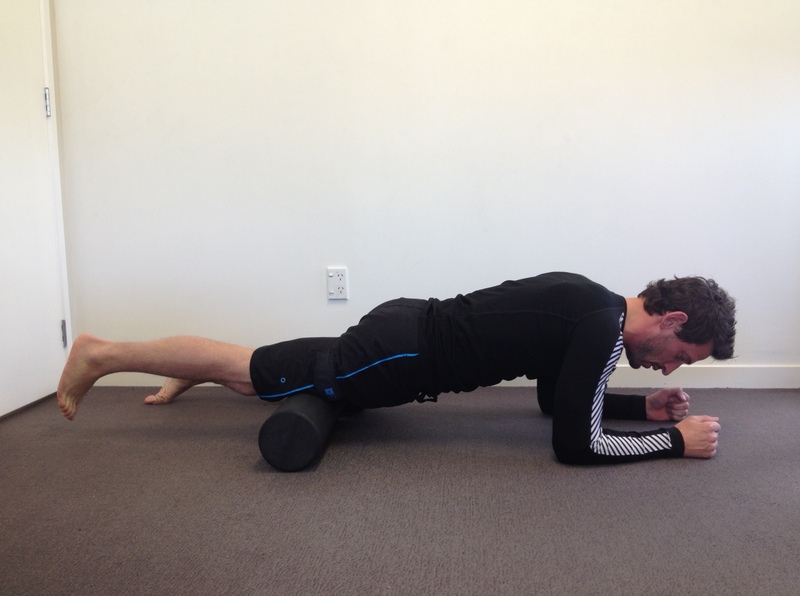 The act of FR derived from myofascial release techniques and developed into Self induced Myofascial Release where use of a foam roller was used instead of a clinician. Myofascial release is the act of pressure and stretch on connective tissue with the aim to induce the stretch reflex. This confuses me as the stretch reflex causes the muscle to contract, when I thought we wanted the muscle to relax?? Perhaps I missed something or perhaps I best get my head back in the books and read around the stretch reflex?…..Myofascial release is a really hazy topic. It has been researched extensively with mixed outcome. It is understood to be the reason behind muscle pain and tenderness in the absence of noxious input which is commonly known as nociception. Yet a recent paper has refuted the concept of the myofascial pain syndrome and trigger points, explaining that the phenomena has more of a neurophysiological link (reference). FR is widely used in physiotherapy and the fitness industry with popular beliefs that it can have the same effects as massage therapy/myofascial release to increase athletic performance, alleviate muscle soreness, relieves joint stress, improves neuromuscular efficiency, and improve joint range of motion. There is evidence to suggest this albeit limited and somewhat questionable as it is with research. Massage has been researched extensively and although it is claimed to have some therapeutic benefits, the evidence steers towards the act of touch as a very powerful medium that creates a number of descending inhibitory effects including pain relief and relaxation (reference, reference). Descending inhibition is when your brain releases a cocktail of hormones, opioids and neurotransmitters such as endorphins, noradrenaline and serotonin. I am not discrediting the use of massage I still use it in my clinical practice due to the above effects. However the jury is out on massage I would never advocate it as a standalone treatment, which is the same for FR. Giving somebody a rub makes them feel good but I have experienced too many athletes and individuals that have an injury, say it will be alright have a rub before a game or an event for them to end up in a worse state than prior to the massage. Yes I want to provide a form of pain relief to my patients but at the same time educate them. I am just more aware of the reasons why I do it. I take the same stance with FR. Use it as an adjunct but not as a standalone treatment. Evidence is limited on FR but there is an extensive list of claimed effects that include: increased range of movement before physical activity? increasing blood flow? (reference), performance increases including sprint time, vertical jumps, power and dynamic strength/endurance effects? (reference) and also reducing Delayed Onset of Muscle Soreness (DOMS)? We are not entirely sure about the actual mechanisms of DOMS but it appears to be related to micro-trauma within a muscle. However there is most likely a nervous system component (reference). DOMS is commonly associated with the feeling of knots and taught bands of tissue. I question whether that is actually what we feel? I would hasten to claim that the muscle needs to be massaged out. I have performed sensory feedback techniques and end up getting the same relaxed state in a muscle as I would with massage (reference). So yes it has been proposed that foam rolling is useful for connective tissue recovery and as DOMS tends to manifest in the musculo-tendinous junction it would make sense to foam roll these areas. Despite all these groovy effects they are short-lived and with the limited evidence there is plenty of scope for conjecture (reference, reference, reference). 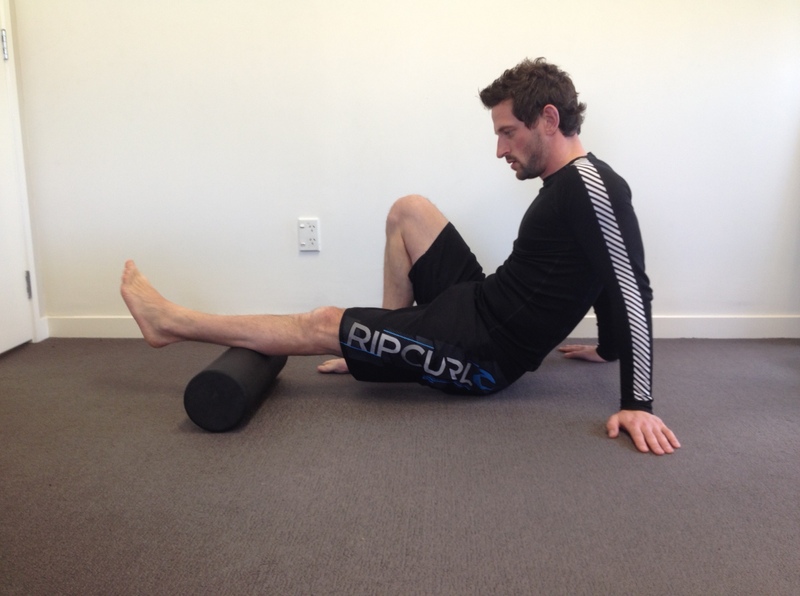 FR involves laying the desired body part to be treated onto the roller and using your bodyweight to create a compression effect whilst rolling out the tissue, hence the concept of releasing connective tissue. Connective tissue is the stuff that lines your muscles so it’s all over your body. Yet connective tissue is based within many forms of tissue and it is made up of a range of components including collagen ranging from type I to type III that are the most abundant in the body, ground substance, extracellular fluid and cells, fibers and GAG chains. GAG chains attract water and make connective tissue extremely resistant to compression so why then compress something that is resistant to compression? This presents to me as somewhat of a conundrum. So despite my skepticism here are some examples of rolling out major muscle groups of the lower limb. 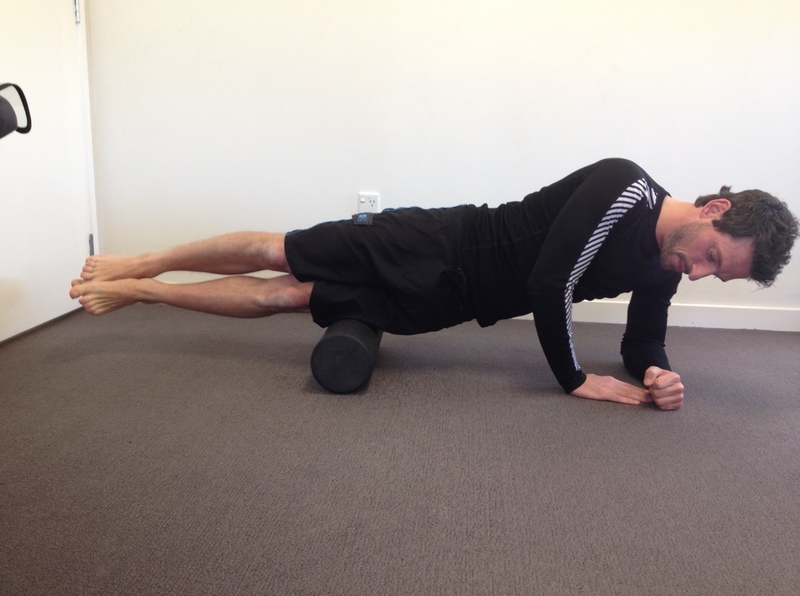 So the naked physio “how long should I foam roll for?” I hear you ask! Well it is suggested that a time limit of up to 60 seconds brings about the therapeutic effects as described above (reference, reference). There you have it, the evidence suggests (although a bit hazy) that FR is a useful adjunct to a pre and post exercise regime, reducing DOMS, increasing joint ROM and increase athletic performance in the short-term (all a wee bit questionable). However it is possible the use of FR may induce descending inhibitory effects resulting in the above therapeutic effects (reference). Having tried FR and using it in clinical practice I can see the value of it from a clinical application and subjective experience. The physiological effects on connective tissue and thoughts around myofascial release are what I refute. I use it merely as an adjunct to facilitate recovery and something for the individual to do. I never use my treatments in isolation and always advocate graded exercise in my approach as this has been shown to have long term effects (reference). Previous Mirror Mirror on the wall why do I experience pain with no movement at all?